Lightweight, Durable, Versatile this extremely portable solar panel works in low light conditions and provides power for a wide range of electronics. The solar panels are mounted to a light weight, weather resistant fabric which easily unfolds for use and folds again for storage. Weighing only around 1.45 kgs it is very compact and easily into most bags or rucksacks. On the ground, on the roof of your car, boat or caravan, the unmatched durability (military tested) of the Power Film Foldable Solar Panel allows it to be used in even the harshest of environments. No "sun soaking" required. PowerFilm, Inc., the parent company of PowerFilm® Solar, warrants that this PowerFilm® Solar product is free from defects in materials and workmanship that impact performance for a period of one (1) year. Power Output Warranty: PowerFilm warrants to the original purchaser that under standard PowerFilm test conditions the PowerFilm ® Solar product will produce 80% of the minimum rated output for the term of three (3) years. 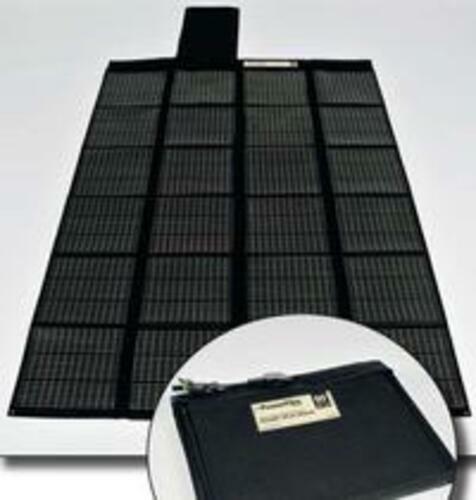 The warranty offered by PowerFilm, Inc. applies only to the solar products sold by PowerFilm. The warranty does not apply to any device in which the solar product has been connected. Please be sure to check your device prior to connecting any solar panel for power requirements. The PowerFilm, Inc. warranty does not cover products that have been used improperly. For proper use guidelines please refer to the instructions included with each PowerFilm solar product.